Re-think your entire workflow with a solution-ready wide format system that delivers a whole new way to create, store and share documents. The Lanier MP CW2201SP is an all-in-one, full color and black-and-white MFP that enhances your level of sophistication at every stage of planning and development. From detailed maps to rich CAD drawings and plans, you can achieve wide format output that exceeds your high standards — and helps you capture new opportunities. Architects, engineers, contractors and designers — those who can truly appreciate smart design — will embrace this system's ergonomic features and unique clamshell configuration. It offers easy front access to paper rolls and ink cartridges. An attached paper basket neatly collects and stacks printed output. And a new LED lamp indicator illuminates during operation, reducing the risk of someone unintentionally opening the front cover. The new 10.1" Smart Operation Panel offers you a true tablet-like experience. Designed for ease of use, it features a large, full-color immersive display for easy viewing and tilts freely from 0 degrees to 55 degrees. The intuitive controls deliver the same user interface found on Lanier's general office MFPs. Walk right up to the control panel, authenticate yourself with the optional NFC card reader, then access up to three thousand files stored on the Document Server. Everything you need to be more productive is at your fingertips. Navigate your way around the interface with the familiar ease of drop down menus and pinch and flick functionality. Seamlessly tap into cloud-based applications to streamline complex tasks. Use productivity-enhancing apps to perform common functions. Customize your experience even further by creating shortcut icons, widgets, personalized wallpapers and more. Create color-rich, vibrant images and show your work in the best possible light. Produce razor-sharp drawings and designs with up to 1200 x 1200 dpi print resolution and 2400 dpi TWAIN scan resolution. Adjust color, contrast and density with ease. Achieve precise, full color results with less spread and smudge, thanks to the MP CW2201SP's dual print heads and our newest pigment-based ink technology. 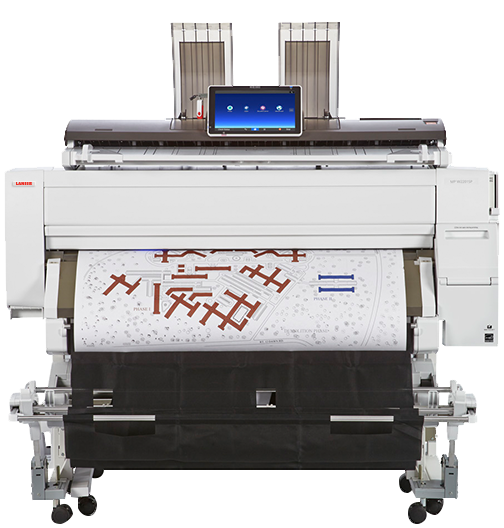 Realize superior image quality and results on every job, with fast-drying ink and minimal dot spread. Support your mobile workforce with Ricoh's Smart Device Connector App. Connect via Bluetooth, NFC technology, or by scanning the QR code directly on the panel, and perform a full range of multifunction capabilities directly from your Android or iOS device. Plus, print and edit any file quickly and easily — even if you don't have the software application that was used to create the original file — with the Ricoh PrintCopy Tool. Achieve true document mobility with a built-in color scanner and powerful scan-to functionalities. Scan to Email/Folder/FTP/URL/HDD (Document Server) — right from the control panel — and get critical files where they need to be, faster. Walk up and easily print or scan from a USB drive or SD card, thanks to convenient USB/SD card slots located directly on the control panel. Share data quickly, seamlessly and more securely with the standard 10/100/1000Base-TX Gigabit Ethernet interface. Help close security loopholes and create peace of mind with security features like Standard HDD Encryption, a DataOverwriteSecurity System (DOSS), Unauthorized Copy Control and Password-Protected PDF.